Tis the season to be gaming… and I’m here to help. That’s right, it’s time for my favorite annual tradition, The Dice Hate Me Holiday Gift Guide! In this year’s guide I’ve carefully selected an assortment of titles that will satisfy a particular appetite of just about everyone special in your life – whether they’re a veteran gamer or novice. Remember, the best part about giving the gift of a game is that you get to play it after they unwrap it! It feels almost like cheating, but it’s not! So stoke the fire, grab some hot cocoa, and start your holiday shopping list with these great games. May all your rolls be sixes and your resource cubes plentiful. Happy Holidays and Happy Gaming! If the number of pirate-themed games on the market are any indication, gamers absolutely love their buccaneers. Although there are many, few are as well-produced or fun to play as Black Fleet. In the game, players manage a hand of cards to move three different types of ships: A pirate ship (which can attack other ships, steal loot, and then hopefully bury said loot without getting looted or sunk), a merchant ship (which picks up goods at one port and then delivers them to another port for potentially big rewards), and one of two neutral Navy ships, out to patrol the waters and which players can use to sink rivals. Turns are quick and action high as pirate ships are quite often sent to Davy Jones’ Locker (a sunken ship starts at the corner of the map the next turn – you can’t keep a good pirate down). The game is as gorgeous as it is enjoyable; the art of the cards and game board is stunning, and the little plastic ships will delight kids as well as your inner kid. Set sail for pirate fun, matey! 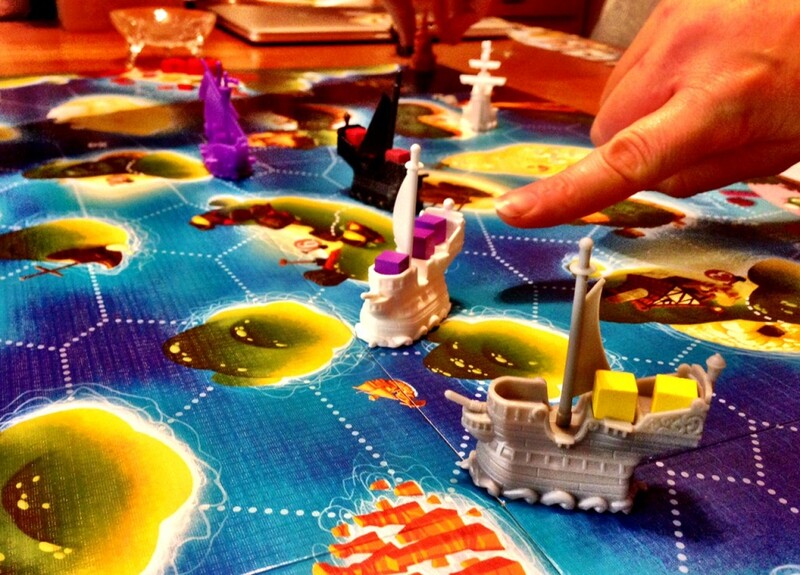 Black Fleet is a game for 3-4 battlin’ buccaneers from Sebastian Bleasdale. It retails for about $60 and you can buy it online here or at your Favorite Local Game Store. An old, almost-forgotten Victorian Christmas tradition is telling ghost stories on Christmas Eve. It’s true! Andy Williams even sang about it. It’s time to revive that old tradition on Christmas Eve with Mysterium. In the game, one player plays a ghost who’s been murdered (yes, a tad dark, but bear with me). The ghost’s goal: To get a group of mediums – the other players – gathered at a spooky mansion to help remember exactly who did the murdering, with what device, and in what room. The ghost achieves the goal of this supernatural game of Clue by silently handing each medium one or more cards filled with strange, surreal art that will, hopefully, allow the medium to discern the weapon, location or suspect which they have been specifically assigned. The group has exactly 7 hours (rounds) to figure out the mystery, solve the murder, and win the game. The concept is a simple one, but players will often find that the game takes fascinating turns as the ghost attempts to delve into each medium’s psyche and deliver just the right archetypes to solve the puzzle. 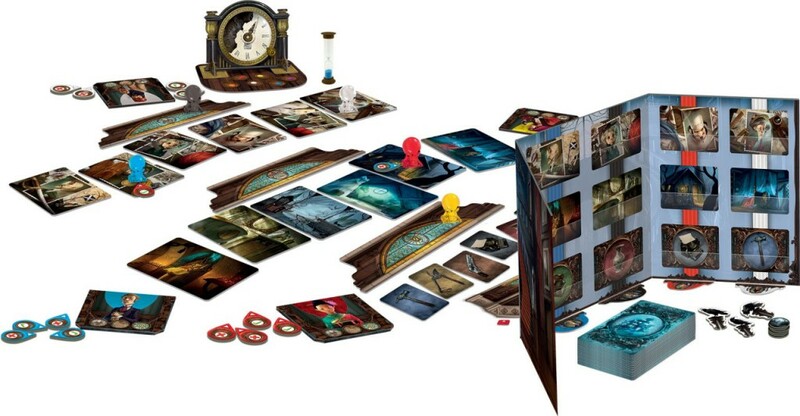 Mysterium is a game for 2-7 ghost whisperers from Oleksandr Nevskiy and Oleg Sidorenko. It retails for about $50 and you can buy it online here or at your Favorite Local Game Store. When the card-based Race for the Galaxy was first released in 2007 gamers everywhere absolutely lost their minds over it. The game used an interesting lead/follow mechanic that allowed players to build up their tableau with cards that often generated a hefty points-collecting engine by game’s end. Although I thought the game was clever, I found that the overwhelmingly obtuse iconography made it hard to teach and, sometimes, to play. Thankfully, most of those negatives have been addressed in the dice-based Roll for the Galaxy. The lead/follow mechanic is still intact, but players now manage a pool of dice to build out their tableau with tiles, and it all feels so very satisfying. There’s far more flexibility in how you use your dice each turn than there ever was for cards in the original Race, so casual players won’t feel hamstrung when the dice are occasionally filled with the hate they usually reserve just for me. 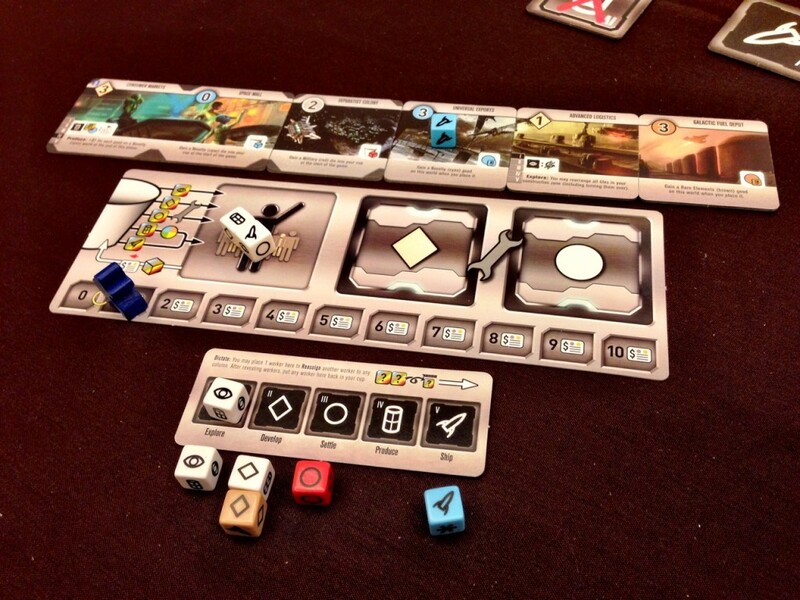 Roll for the Galaxy is a game for 2-5 cube junkies from Tom Lehmann and Wei-Hwa Wang. It retails for about $60 and you can buy it online here or at your Favorite Local Game Store. It’s the deck building game all about building your deck! Your favorite game-playing handyman and Dominion fan alike are guaranteed to enjoy this faithful recreation of crafting a backyard bastion of your very own. In the game, players use cards representing various types of wood planking and rails to build up their deck of cards… and the deck in front of them! Players earn points by stringing together similar plank styles; the more expensive the wood, the better the points. Players have to be wary of their rivals, however, as they could sabotage their decks with rotting planks, breaking up valuable deck space. Fear not, though – players can prevent that brand of shenanigans by staining parts of their deck and protecting it from the elements! It all sounds like a joke, but I assure you it’s a real, fun game. But it’s also a joke. Except that it’s real. And did I mention fun? It’s also its own expansion, so if you buy two games four players can play, with three games six players can play, and so on! 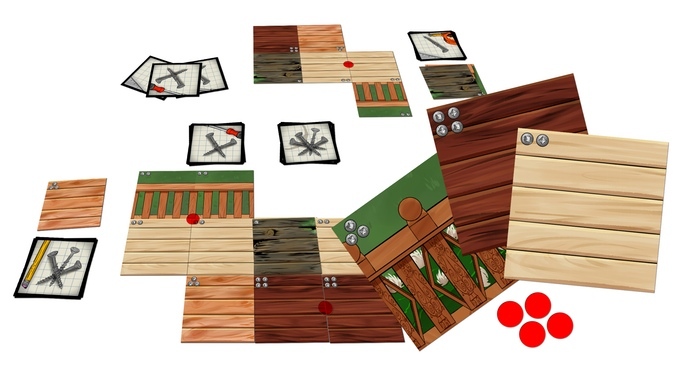 Deck Building: The Deck Building Game is a game for 2 crafty carpenters from Christopher Badell. It retails for $9.95 and you can buy it online here or at your Favorite Local Game Store. 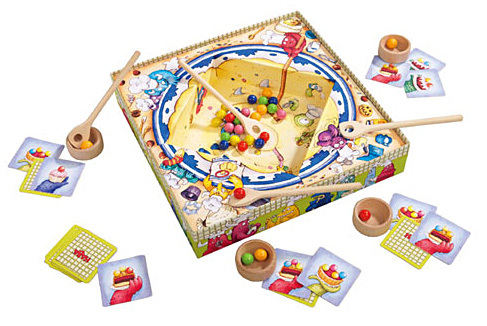 It just wouldn’t feel like a complete Holiday Guide without the traditional HABA game entry, and this year’s recommendation does not involve stacking anything – shocking! Nope, this year it’s all about balls. Little wooden ones, to be more precise. In Monster Torte you’re handed a spatula with a hole in it. In front of you is a pit filled with wooden balls in six colors that represent the edible tchotchkes that top the cakes that you and the monsters have been baking (hey, it makes more sense than most of Yo Gabba Gabba). A card is flipped over that has a specific set of the balls and then everyone frantically tries to grab the balls with their spatula and drop them in the mixing bowls in front of them. First player to do so wins the round; five cards wins the game! Like most other HABA titles, the game is ridiculously fun while being stupidly simple, and everyone playing and watching will be grinning from ear to monstrous ear. Monster Torte (Monster Bake) is a game for 2-4 baking beasts from Stefanie Rohner and Christian Wolf. It retails for about $30 and you can buy it online here or at your Favorite Local Game Store. As the title no doubt indicates, the year is 1901 and construction in New York is booming! In the game, you take on the role of a real estate developer at the dawn of the modern skyscraper era. Players will draft and use cards each round to claim plots throughout the city and then construct buildings in several shapes and sizes. Claiming the right spot and keeping your competitors from crowding you out is paramount, as is maximizing your real estate so you can claim more prestige at the game’s end. 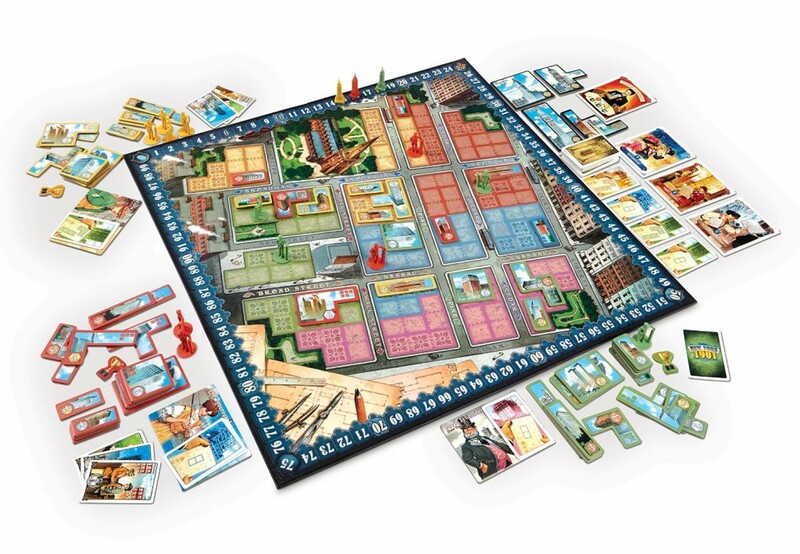 The game ramps up nicely with two basic build phases – the bronze and silver – and toward the end it becomes a race to be the first to claim and contruct legendary skyscrapers like the Woolworth or Metropolitan Life Buildings. Although the game is pretty easy to understand, some gamers with less-than-stellar spatial reasoning may find the Tetris-like puzzle of the building tiles a bit daunting. Still, the history, the grand components, and the cool feeling of skyscraping accomplishment will keep gamers from giving it the old Bronx cheer. New York 1901 is a game for 2-4 Empire State entrepeneurs from Chenier La Salle. It retails for about $50 and you can buy it online here or at your Favorite Local Game Store. Long-listening fans of The State of Games podcast will no doubt be familiar with this old chestnut – probably because I haven’t been able to shut up about it for the past four years. Yspahan is, without any shred of hyperbole, one of the best Euro games ever designed. The heart of Yspahan lies in the dice drafting mechanic; each round the lead player rolls the dice and then assigns them according to number to the tower tableau. Each player, in turn, then chooses a tier of dice that are left to either place influence in the souks (storefronts) in the city with the hope to score points for area control at the end of the week, take gold coins or camels which can be used to influence the Shopkeeper or construct new buildings or devices for variable powers, or take a card that can grant a boon in resources or dole out extra points. It’s one of those rare gems that plays in under an hour and yet still delivers that rich, full feeling gamers often feel after playing a long, complex title – otherwise known as the “Euro high.” Plus, camels; anyone that knows me knows that where there’re camels there has to be a good game. Guaranteed. Yspahan is a game for 3-4 souk settlers from Sébastien Pauchon. It retails for about $40 and you can buy it online here or at your Favorite Local Game Store. Hey, speaking of camels here’s a game where they’re racing! Players aren’t acting as jockey’s though – this game is all about placing bets and praying the stubborn camels go where you’re hoping. During the game, the camel’s are controlled by colored dice that are shaken and removed, one at a time, from the dice pyramid. Camels may move several spaces or hardly at all, and some camels may end up on the backs of other camels to be carried closer to the finish line! Players can bet on what they think might be the winning (and losing) camels at several points throughout the game; you can wait until the camels are closer to the finish to make a more educated guess but you risk other players placing their bets first and, therefore, getting a bigger payout. 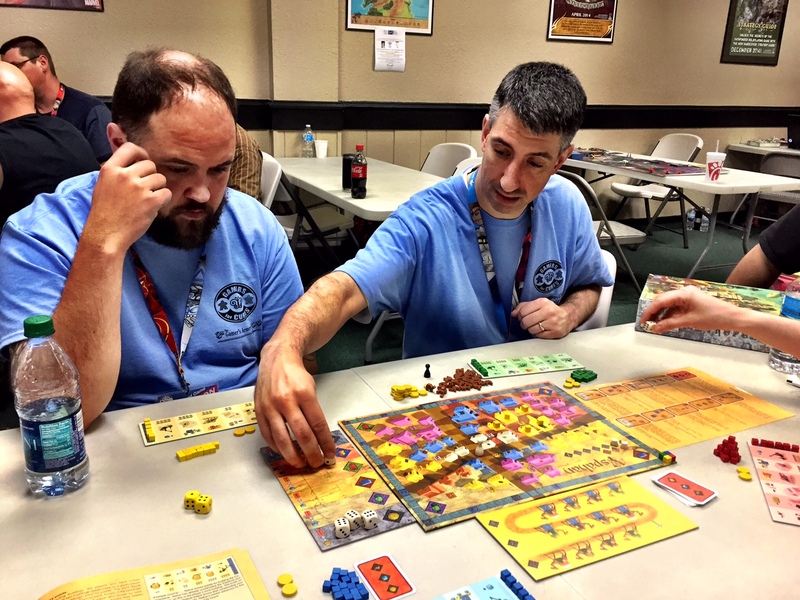 The press-your-luck betting combined with the wacky unpredictability of the camels make this title feel like a fulfilling party experience that larger groups can enjoy. And, hey, camels. That there’s the sign of quality. Camel Up is a game for 2-8 gamblers from Steffen Bogen. It retails for about $45 and you can buy it online here or at your Favorite Local Game Store. Hey, another Dice Hate Me Games title! I know everything that went into making them, so they make for easy recommendations; plus, I’m incredibly proud of the production behind Bottom of the 9th. In this game it’s the bottom of the 9th inning and the score is tied. All the home team has to do is score one run and they’ll pull off the upset, but it won’t be easy as they face off against the best pitching team in the league. Each turn, the batter tries to get inside the head of the pitcher and figure out what’s being thrown. Players do this by secretly choosing a side on each of two tokens and then reveal. If the batter is able to guess the pitch, variable powers and special MVP abilities will be unlocked that will help with rolling the dice to hit; the same goes for wily pitchers who are able to sneak a crafty pitch across the plate. If the batters can hold out long enough, fatigue will set in for the pitcher making it easier to guess the pitch. Bottom of the 9th condenses all the excitement of a full ballgame down into about 10 to 20 minutes of play. And with 20 players right in the box and two expansions that add 24 more players, there’s a ton of game for about the price of a hot dog and beer at most stadiums. 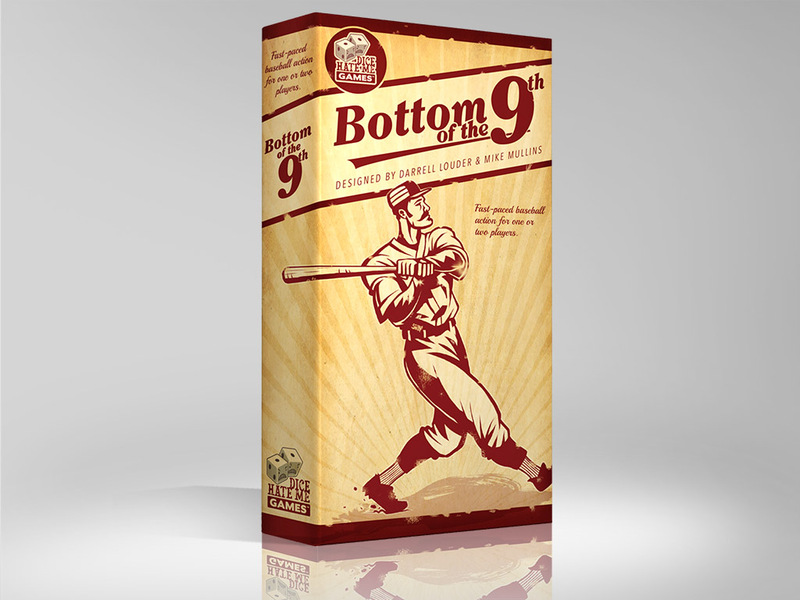 Bottom of the 9th is a game for 1-2 cracker jacks from Darrell Louder and Mike Mullins. It retails for $19.95 (with two expansions at $4.95 each) and you can buy it online here or at your Favorite Local Game Store. It seems like in the past three or four years there has been a renaissance in group “party games” – games that are easy to learn, easy for a large group to play, and suitable for a party atmosphere. Last year it was the sly Spyfall; this year the gargantuan hit is Codenames. 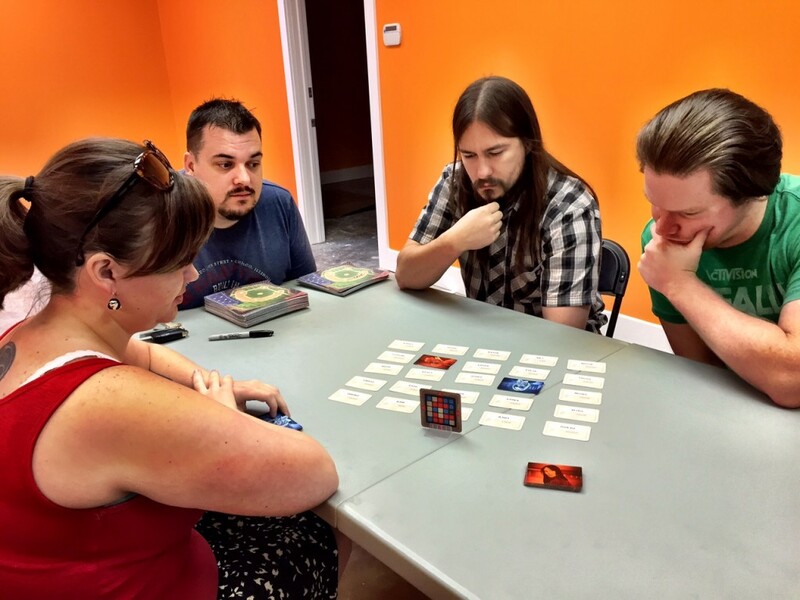 In Codenames, players are divided into two teams each with a captain. A five by five grid of cards with single words like “Himalayas” or “Rabbit” are laid out on the table. The captains sit facing their teams and share a card that shows which words in the grid they must get their teammates to guess in order to win. Captains can do this by saying a word and number combination that signifies a similarity and a number of words that given word might reference; for example, if a captain wanted to try to get his team to guess “dwarf” and “dragon”, the clue might be “fantasy 2”. The devilish twist to Codenames that makes it especially harrowing for the captains is that there is also an Assassin word – if your team guesses that one they lose automatically! Easily one of the best games I’ve played this year, there’s really no reason to decipher why you and your loved ones might need Codenames. Codenames is a game for 2-8 word nerds from Vlaada Chvátil. It retails for $19.95 and you can buy it online here or at your Favorite Local Game Store. It’s freaking huge. And shiny. Hope Santa has a lot of space on his sleigh! Horus Heresy: Betrayal at Calth is a game for 2 space marines from Games Workshop. It retails for about $110 (I know!) and you can buy it online here or at your Favorite Local Game Store. Don’t forget the paint! 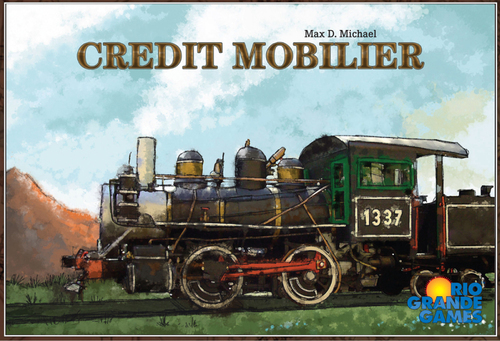 Credit Mobilier is a game for 2-5 mobile creditors from Max Michael. It retails for about $20 and you can buy it online here or at your Favorite Local Game Store. Hands down, one of the best ports of an analog board game to a digital format. 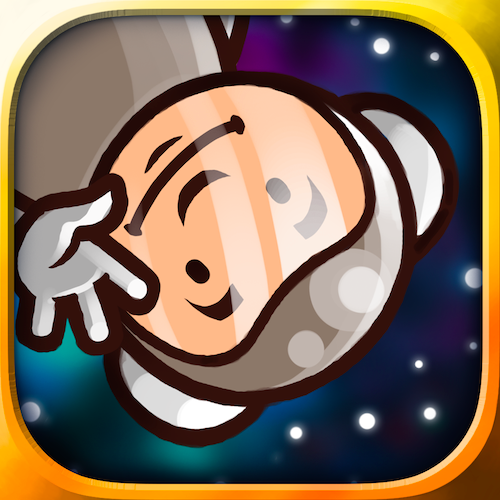 All the charming humor and fun from the original Galaxy Trucker is here as you brave the galaxy, waiting for the next time your cobbled-together spaceship is blown to bits in spectacular – and always amusing – fashion. Galaxy Trucker is from Czech Games Edition. It retails for $4.95 and you can buy it online here for multiple platforms. In Igloo Pop, your goal is to race against the other players: Pick up one of 12 igloos, carefully shake it, and guess how many little Eskimo babies are rattling around inside before rushing to another one. It’s all true; you can’t make this stuff up! As fun as it is absurd, this quirky little gem is the perfect game to get the giggles while getting hammered. 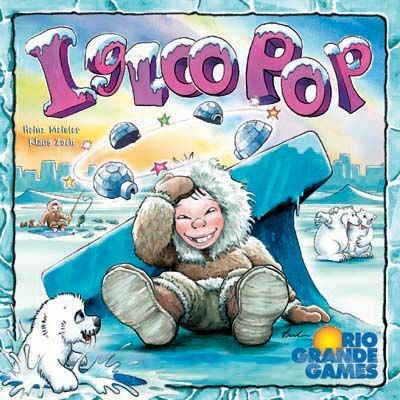 Igloo Pop is a game for 2-6 fishstick-loving ice giants from Heinz Meister and Klaus Zoch. It retails for about $30 and you can buy it online here or at your Favorite Local Game Store.